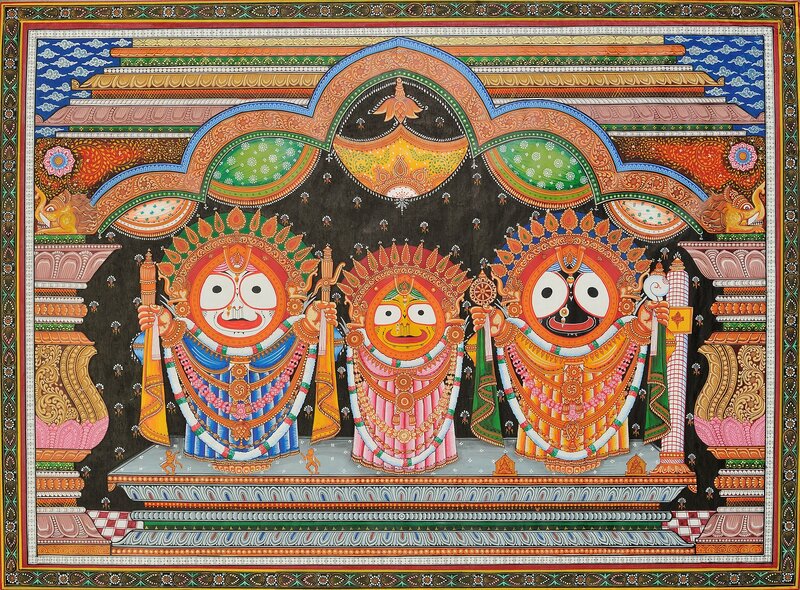 This composition represents the Jagannatha trio in a special ceremonial costume that includes arms and legs fitted to the icons of Jagannatha and his brother. Three different sets of ceremonial limbs are kept in readiness in the temple, to be used as props during special festivals. One set is made of wood and covered with gold, another of pith (an extremely light and easily carved reed), and a third set-black in color- is made of cane and wood. Featured in this painting are the gold-plated arms and legs, as part of the king's costume (Raja-vesha), which is employed on three different full moon days, and also on Dusshera day. Jagannath Ji holds a wheel and a conch shell, while Balarama holds a mace and a plow, attributes typically connected with the two deities. The gold limbs are also used as part of another costume called the gold dress (swarna vesha), which the gods wear as they are taken back to the main temple after the chariot festival.